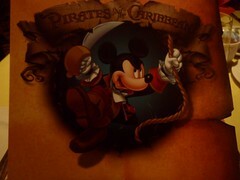 The Pirate’s Menu is in all three restaurants on the night that there is the Pirates in the Caribbean Party. Around dessert time the servers come out and play Limbo and guests can join in if they wish. Our server entertained us with a pretend banjo made with the pepper shaker and a plate cover. 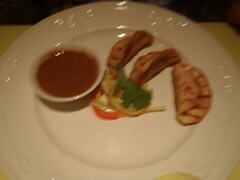 Appetizer – Mik went with the Pirates Golden “Pot Stickers” for his appetizer. 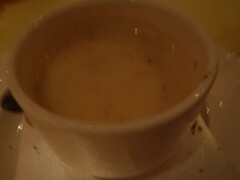 Soup – Mik enjoyed the Caribbean-style Conch Chowder. 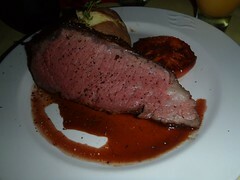 Entrée – Mik thought the Dutchmen’s Dijon Crusted Sirloin of Beef was the best steak he had on the cruise. He substituted the sweet potatoes with a baked potato. 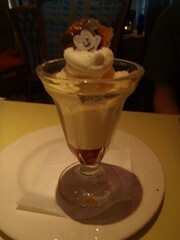 Dessert – Mik tried the Crunch Time Sundae (rum raisin ice cream and pineapple whipped cream) and the Rum Soaked Chocolate Cake. 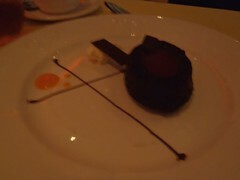 He liked the sundae, but not so much the chocolate cake.